As part of our service to you, the Media Library has over 7000 audio and video digital files from our subscription to PowerMedia Plus. In addition, we have purchased digital rights to almost 400 programs that we have in DVD or VHS but are getting a lot of use. It’s now easier to use the digital content we have in the SOESD Media Library. Just go to our online catalog at http://media.soesd.k12.or.us/ No more logging into PowerMedia Plus separately from our other content. It’s easy and makes searching for teaching materials a one-stop-shopping experience. You can search by word, title or format. Let’s say you want something on Lewis and Clark. 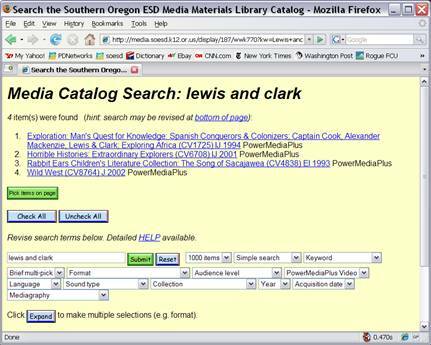 You can type in the words “Lewis and Clark” and everything the SOESD Media Library has on Lewis and Clark will show up. If you just want to see what digital content we have on Lewis and Clark, type into the search box “Lewis and Clark” then use the “Multimedia” drop down menu. Choose PowerMediaPlus audio, PowerMediaPlus video or Science Digital (20 titles we are looking at getting for our collection). The titles that are just digital content will show up in your search. Want more info on how to search for and use digital content? Use these handy dandy how-tos.